This entry was posted in Uncategorized and tagged Bicycling, cycling, infrastructure by christao408. Bookmark the permalink. I love the design and use of valuable space in the city. I like the idea and to be honest I would use it. I love it. Maybe the idea will catch on in other areas. 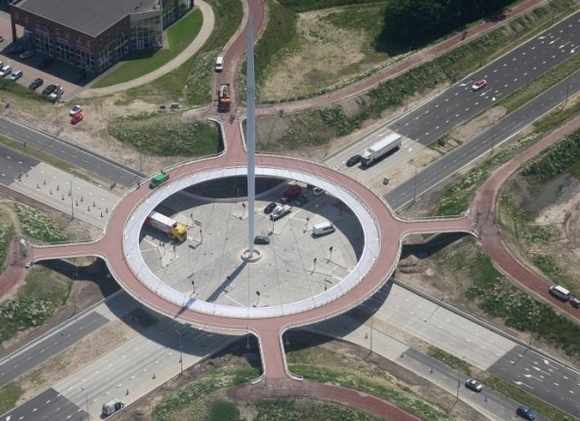 That looks like a much better use for the roundabout than sending cars around it! Pretty 🙂 You should use it and post pictures! This is wonderful! 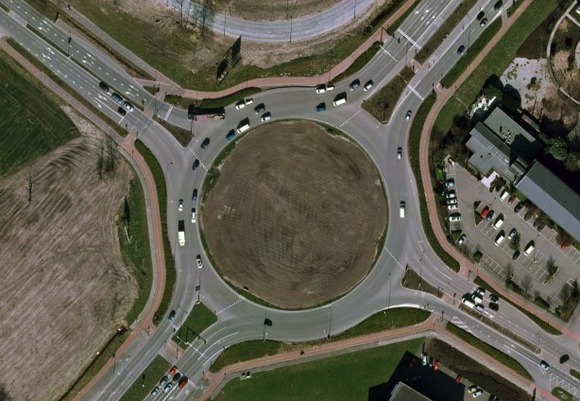 First I hate auto roundabouts. Second I’d love a bicycle roundabout. This is a perfect solution indeed and very pretty too! This is great and we have the round about intersections out at the ocean as well as bike lanes but no suspended. Great shots and what a wonderful idea for a heavy traffic area. 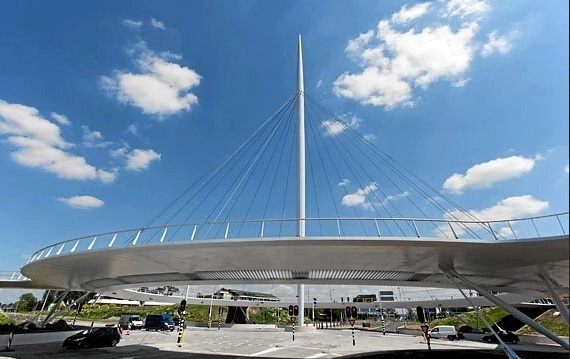 One of the coolest bike accommodations I’ve ever seen.I once dated a wonderful girl from Eindhoven. She’s now an opera singer in West Virginia or some place like that. What a smart solution. But the Dutch are know to be bike crazy. What a great idea. There are a lot of cyclists around here in Lance Armstrong country,and they’re always at odds with motorists. I like this idea – it’s so stunningly simple and practical. Neat and practical. Great idea. We have such narrow bike paths, and these were built after a couple of young kids were accidentally killed by motorists. Cities in the US should plan something like this for the biking population. What other options is there when there is a car traffic mix and pedestrians? In Beverly Hill they have tried the pedestrian cross walk signal. All cars are stopped and pedestrians can cross the street or even go catty corner (from the Northeast corner to the Southwest corner instead of just northeast to south east or North west). It is easier to post an illustration of how that signal works. Somewhat similar is a pedestrian only raised sidewalk in Las Vegas:http://en.wikipedia.org/wiki/Tropicana_-_Las_Vegas_Boulevard_intersectionI couldn’t find on the internet the type of signal I was talking about. @stepaside_loser – @beowulf222 – @Inciteful – @ElusiveWords – @whyzat – @murisopsis – @Fatcat723 – @chronic_masticator – @slmret – @Grannys_Place – @Devilzgaysianboi – @ZSA_MD – @Vitamin_D – @KnightInCROATIANarmor – Yes, it does seem like an elegant solution. The safer we make the streets, the more people who will use them in different ways. @PPhilip – I’ve seen those “all pedestrian” intersections in many cities from Tokyo to New York to Hong Kong. They work wonders for reducing vehicle-pedestrian accidents but of course don’t do much to prevent bicycle-motor vehicle accidents.